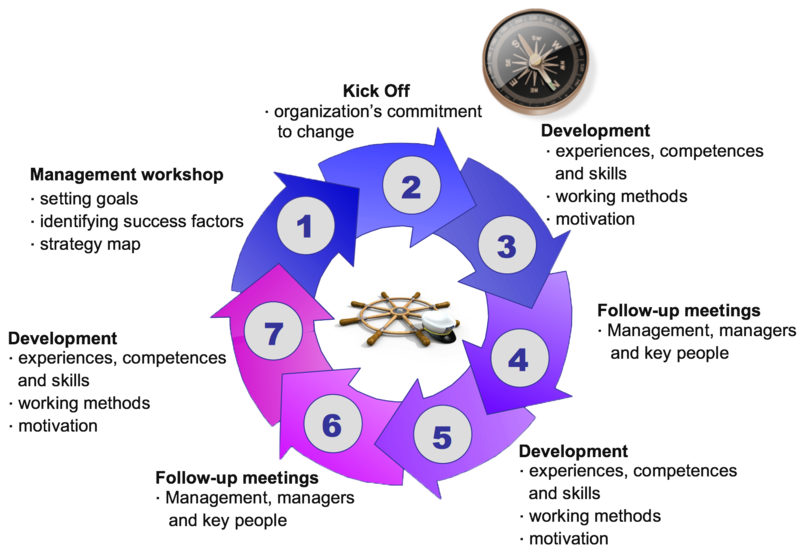 Strategy renewal begins with the identification of possible changes in the enterprise’s operational environment. This also includes an analysis of the influence of both internal and external drivers. We assist our customers to not only exploit the changes in the operational environment brought about by the development process, but to minimize any risks resulting from such changes. This may necessitate changes to strategic goals and also to the implementation of the strategy. BBI’s controlled strategy development model ensures an effective kick-off for the strategy processes. Once the strategy has been formulated, it is imperative that it becomes an integral part of everyday operations and at all levels within the organization. We assist with the introduction of the strategy and with related practical issues concerning its implementation. The graphic below shows the phases of a typical development model. In each case however, we design the phases and their progression on a customer-oriented basis, and take into account the customer’s starting point and requirements. During the management workshop we establish the common goals and identify the success factors necessary for the strategy to succeed. We also break down the success factors into their component parts to facilitate their direction and development. The commitment of the whole organization is a pivotal component in the implementation of the strategy. Sufficient time is reserved for the development of actions that will impact on the critical success factors. In this phase new actions may well be brought in to play, so as to better support the strategy. Follow-up meetings involve both management and those responsible for operations. If necessary, a wider spectrum of the organization can be included. The progress of the strategy implementation is continuously monitored and corrective measures can be taken as required. Corrective measures may, in part, concern the development of know-how and skill sets. Separate development plans will be made for such corrective measures. BBI Sales Intelligence allows us to help our customers to develop sales, sales management and customer relationship management. 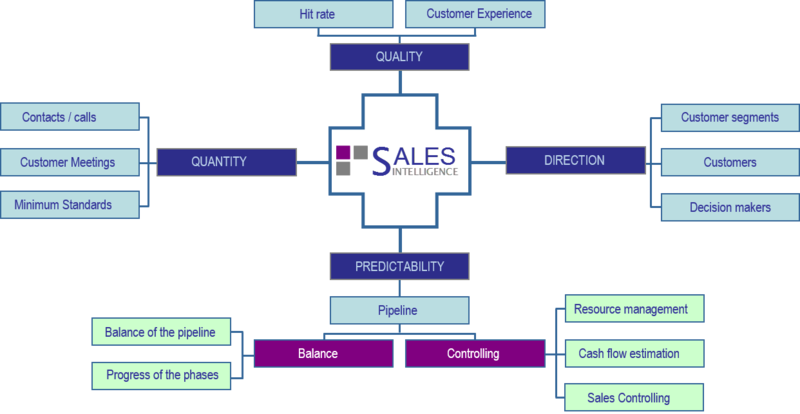 Using our Sales 360 method, we can quickly identify possible challenges and possibilities, thus allowing us to generate rapid returns on the development actions. In conjunction with the customer we ensure that the direction, quantity, quality and predictability of the actions are at the desired level. Throughout this process we never lose sight of the organization’s motivation to achieve the set goals. Customer acquisition, current customer relations development and comprehensive management are worth investing in. Customer relationship (CRM) and customer experience (CEM) management, in tandem with monitoring the impact of practical actions, help to create a competitive edge. We can start the ball rolling by, for example, surveying customer expectations, experiences or satisfaction. We have effective procedures and tools for this. Strategic human resource management, change management, know-how management, personnel guidance and support are all key areas of BBI human resource management. In our customers’ environment of changing resource requirements, we offer the services of our top-notch management and business intelligence experts. A resource requirement may be an acute, short-term expertise need, a longer-duration development project or an outsourced manager to oversee the implementation of changes. Our INTERIM PRO service allows our customers to offer their own expert services to others through our network of partners. This allows temporarily underutilized experts to become productive. Ask for more information about our INTERIM PRO service.